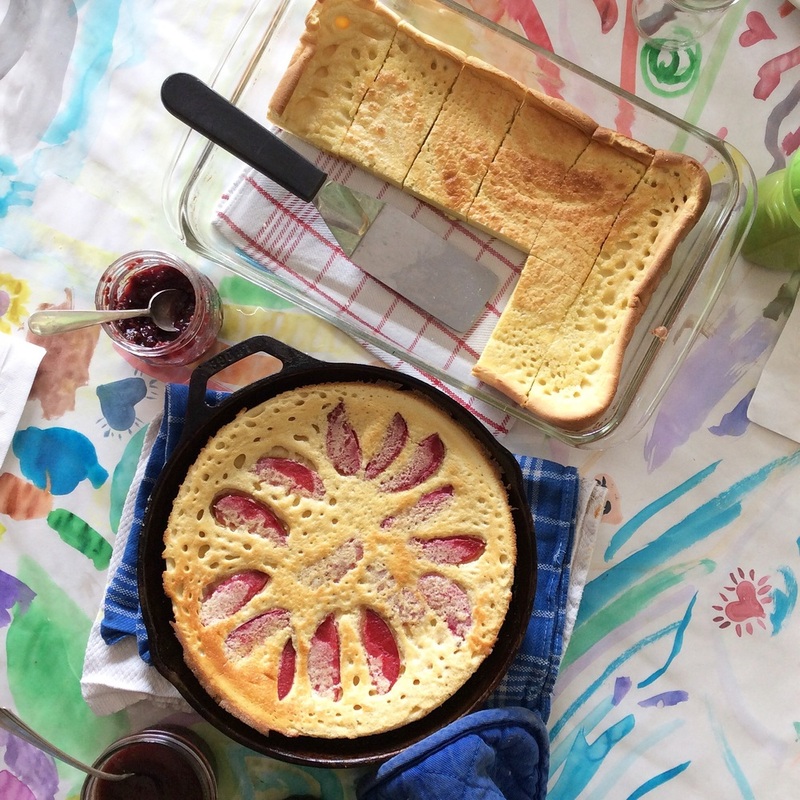 The pretty one in the cast iron pan has plums in it. I just sliced them and layered in a nice pattern right before putting it in the oven. Preheat oven to 400 degrees, or 375 convection. Put your pan or dish in the oven while it preheats. I usually use a full size casserole dish, or a big cast iron pan. Any good size oven proof dish should work. Alternately, you can use a muffin pan or even a popover pan. A good size pie or quiche dish would work too. Dump all of the ingredients, except the butter and fruit (if using), in your blender. I use my Vitamix and it is amazing for this kind of thing because it whips it all up super fast with no lumps. Nothing fancy here - just half a peach sliced and a handful of blueberries, and I left 1/3 plain for the kid that doesn't like fruit cooked in things. When your pan or dish is hot, put the butter in the pan to melt. My butter is always cold, so I usually toss it in the pan and let it melt in the oven for a minute. Once melted, just swirl the dish around a bit to get it all coated with melted butter. Once the batter is blended and the butter is melted, just pour your batter into your hot pan. If you are adding fruit, now is the time. If you want to make it pretty, you can carefully line up slices of fruit in a nice pattern. Or you can just sprinkle a handful of blueberries and call it good. Sometimes I just put fruit on half of it, because I have one child who prefers it plain. And now stick it in the oven! I do mine in my convection, so 375 convection for about 17 minutes is about right. But it's going to depend on the size of your pan and how accurate your oven is. Go for 15 minutes and then take a peek. It should be puffed up and nicely brown around the edges, and no longer wet in the middle. If it's not quite there, give it a few more minutes. When you take it out of the oven it will sink pretty quickly. So if you want to impress your guests, just make sure they are at the table when you bring it out. This one was made with a gluten free flour blend. I've done this with AP flour, bread flour, whole wheat flour, and even a gluten free flour blend. Because the flour just gives it some density and holds it together, but doesn't actually rise, the type of flour doesn't really seem to matter. A friend of mine made it with a grain free cassava flour and she said it was also great. If you try it with a different kind of flour, definitely let me know how it turns out! I use maple syrup to sweeten because I like the taste, but I've also made it with honey or just regular white sugar. Also great. If you like cinnamon, add a teaspoon. This would be especially great if you are adding sliced apples on top. A lot of recipes you see for these call for powdered sugar on top. I don't bother because I don't think we need it, but if you like that and you want to make it look a bit more fancy, go for it. Just sprinkle on top right before serving. When I make it plain with no fruit, we love to have a little homemade jam on top. It's delicious that way. This is so easy, but looks impressive and makes breakfast feel special without doing a lot of work. It's great for feeding a crowd, because you can whip up a couple of them in just a few minutes. 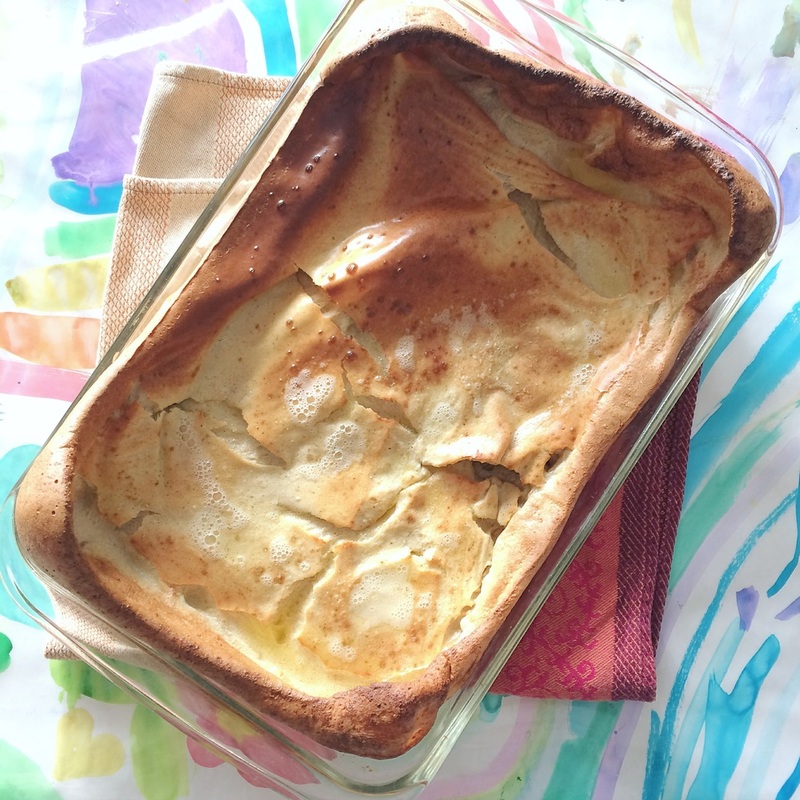 I like this recipe better than some others because it has more eggs, so it seems a little richer, and gives the kids a decent amount of protein in a breakfast that tastes like a treat. I think you could even mix up your batter the night before if you want, and just give it a quick stir an pour in your pan in the morning. It would be great for a Christmas or Easter or other holiday morning, because it seems so fancy and special, but really is minimal time in the kitchen for the cook. Same batter, just poured in muffin pans. It worked just the same and the kids loved the little personal size!